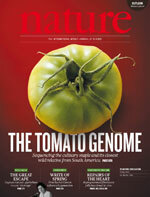 but similar to soybean, tomato and potato small RNAs map predominantly to gene-rich chromosomal regions, including gene promoters. The Solanum lineage has experienced two consecutive genome triplications: one that is ancient and shared with rosids, and a more recent one. These triplications set the stage for the neofunctionalization of genes controlling fruit characteristics, such as colour and fleshiness.